I’m an Ohio poet and novelist who hopes to write a novel good enough for Ray Bradbury to rise from the grave and give me a thumbs up. Everything else interesting about me is my writing itself. Outside of that I’m just vanilla ice cream. Writing definitely. I wouldn’t realize writing was a profession I could have until I was in middle school and the guidance counselor came to my class to talk to us about what we wanted to be when we got older. Writing was just so wonderful to me I didn’t think you could get paid to do it. My parents had jobs, very hard jobs that made them tired and not a lot of money. So I thought that’s what I would have to do. Have a job I didn’t like. Though it took me eleven long years to get a publishing contract, realizing I could have writing as a career, was like being told I could pocket all the stars in the night sky and have light with me forever. Let’s talk books and influences. Who is your favourite author? Do you have a favourite book or seven? It’s hard to say my absolute favourite author. That’s like choosing a favorite heartbeat. I can’t live without any of my heart beats. Same can be said about me and my favorite authors. Seven of them are Ray Bradbury, Shirley Jackson, Donna Tartt, Poet James Wright, Kazou Ishigaro, Agatha Christie, Harper Lee. How long has the road to becoming a successful writer been for you? Eleven years. Writing is the easy part. Getting published is the hard part. I wrote my first novel when I was eighteen years old. I wouldn’t get a publishing contract until I was twenty-nine for The Summer that Melted Everything which is my fifth or sixth novel written. For me it was eleven years of rejection and fear I’d never be published. Literary fiction, the genre I write, can be difficult for publishers to take a chance on because they consider it not as lucrative as commercial fiction. Especially when you write darker literary fiction like I do. Even when I got the deal for The Summer that Melted Everything I had no idea it would be two more years before I saw the book on the shelf. In this fast-paced world, publishing still moves at a snail’s pace unfortunately, so with all the years added up, I’ve been waiting thirteen years to see a book on the shelf. July 26th will indeed be a very special day. Let’s talk writing. What do you love about writing? Falling in love with the characters and their stories. Let’s talk setting – the setting is the summer of 1984 – why this particular time period? When I think about the 1980s, I think about a decade-long summer with its neon colors, big hair, and even bigger ambitions. I was born in 1985 so I can’t attest to if this is true about the decade. But for me the 1980s was a natural home for this story. 1984 was the year I chose because of its parallels to George Orwell’s masterpiece, 1984. 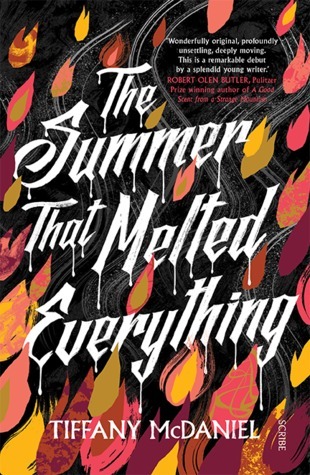 I don’t want to give any spoilers away but readers will know the significance of Orwell’s novel in relation to The Summer that Melted Everything after reading. Lets’ talk about naming characters – I love the sound of the name Fielding Bliss – how did you determine the names of your characters? If you had more time what you be doing? Indiana Jones-ing my way around the world. Or just sitting out on the grass at night, looking up at the stars. What is your favourite film of 2016 so far? I don’t believe I’ve seen any of the new movies released this year. I’ve just been too busy. I will say one of my favorite films of all is Stanley Kubrick’s The Shining. Let’s talk next book – I assume there is one in the pipeline? This book will quickly draw you in and mesmerise you with its beautiful prose. It will enchant, it will enthral, it will make you shake your head in disbelief and then you will reflect a little and sadly have to agree…this could happen, this or something like it has already happened…. somewhere, to someone…be careful what you say, words once spoken cannot be unheard. This is a book that will have a profound effect on the reader (aside from the awe you will feel for the delicious prose). There are words, there are sentences, there are paragraphs and pages you will just want to highlight or underline and shout YES!!! When you read this book there are two particular passages that stand out in my mind, analogies with leaves and another with roses, let me know if these spark brilliant illuminations in your mind, they did for me; beautiful descriptions, searing moments of brutal honesty and perfect understanding. The writing here is remarkable…I predict…awards, awards and more awards for this incredibly wonderful and talented author. And did I mention that this is Tiffany McDaniel’s debut work? Seriously amazing!!! Good daughters hold their tongues, obey their elders and let their families determine their destiny. Rebellious daughters are just the opposite. 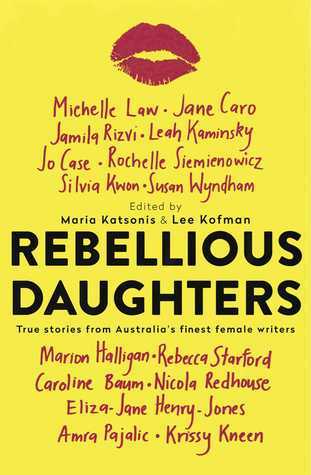 This is an extraordinary collection of memoir – so readable, so interesting…this eclectic mix of women authors that truly reflects the breadth and depth of contemporary Australian women writers. 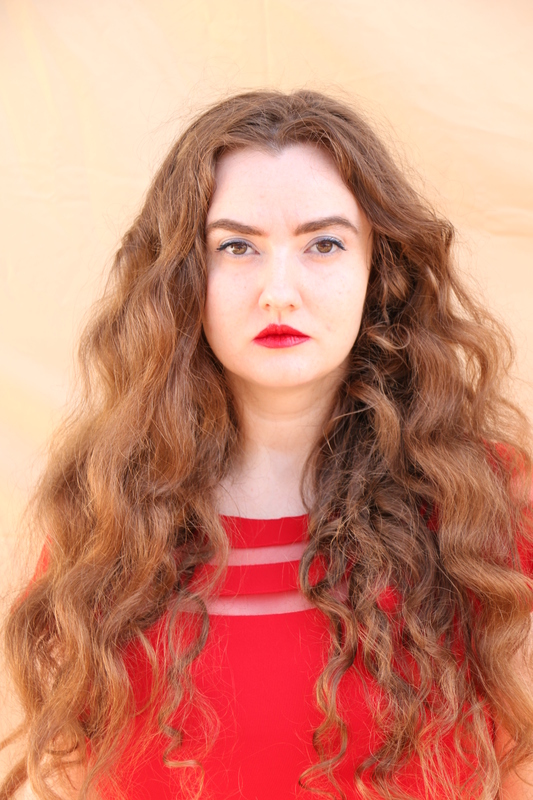 The women here are so brave – open, honest and willing to share their innermost secrets. Reading this is like having a peak in someone else’s diary or like listening to your best friend share their thoughts and feelings, struggles and joys. Reading as a feminist there is plenty of material here for discussion – the notion of the “good girl”, the pressure placed on the woman/child to conform. Many stories draw attention to the intersecting expectations of culture/race/age and sexism that weigh heavily on women’s shoulders. But it is not a negative book – it is inclusive, optimistic and realistic! I can imagine the conversations this collection will inspire. Reading purely for pleasure, this is a brave, inclusive and exhilarating read – for aren’t we all, even slightly, a rebellious daughter? And it is great to know that by buying this book you are contributing to the Women’s Legal Service Victoria. Welcome Kate to my blog. 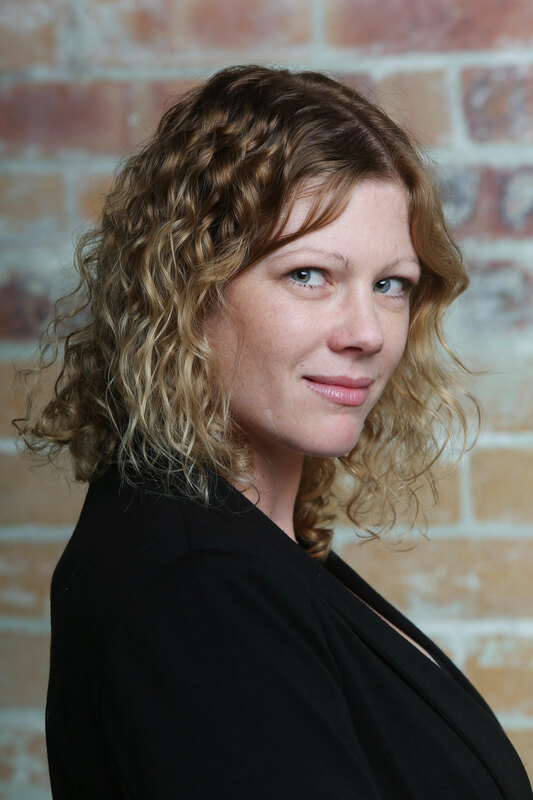 Kate Kyriacou is the Brisbane Courier-Mail‘s chief crime reporter. She has won awards, both at a state and national level, for her work as a crime writer. You see and hear a lot of things as a journalist. You sit in court, you stand at crime scenes. You talk to investigators, lawyers, witnesses. You talk to families, grieving families who have lost someone. So many things stay with you. I once walked into a house set up for a kid’s 18th birthday party. There were balloons and streamers and presents. But he’d died that morning – along with two of his mates – in a car crash on a country road. But there is nothing quite like the total immersion that comes with writing a book. Day after day I sat reading through research, court transcripts and articles on an eight-year investigation into the kidnapping and murder of a 13-year-old boy. Thousands of pages. Many, many phone calls. 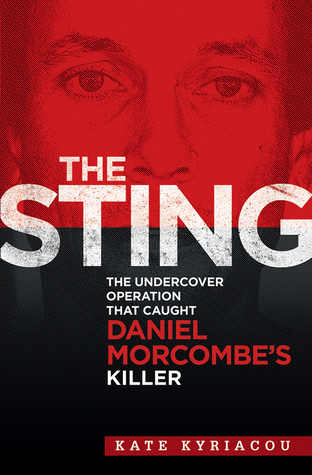 I wrote The Sting after sitting through the trial into Daniel Morcombe’s murder. Covert police had spent months posing as members of a criminal gang, convincing their suspect, Brett Peter Cowan, that he was on his way to being one of them. Soon he would be earning big money, living a life of fast cars and parties – a brotherhood. He’d never been part of anything, so by the end, he was hooked. It was incredibly rare to get such an insight into the workings of a covert operation. In court we heard recordings, testimony from covert officers and had access to pages and pages of transcripts. Later, I was given access to one of the covert officers and gained more insight through my own research. It’s a horrible thing to enter that world. To listen to the things a man like Brett Cowan likes to talk about. It’s hard to imagine what it would have been like for those covert officers. I know they hated him, hated having to laugh along every day, join in on his jokes. And the secrecy of the operation meant they had nobody to talk to at the end of each day. The judge talked about it in court before some of the recordings were played. Just be aware, she told Daniel’s partners who sat in the public gallery, that these covert officers are saying things and responding to things in order to further the investigation. They don’t really find him funny. They don’t really mean the things that they say. This is not who they are. I dedicated the book to those guys. Because of the work they do, their identities can’t be revealed. And that means they can’t get the public recognition they deserve for the incredible work they did. The story of the police sting that resulted in the confession of Daniel Morcombe’s killer reads like crime fiction. An elaborately staged fake crime gang, run by a ‘Mr Big’ that lured Brett Cowan in with the promise of a hefty payout. It was the stuff of a TV crime series rather than an Australian police operation. The Sting reveals extraordinary new detail and a shocking insight into one of the country’s most evil killers, and the operation that brought him down. Go behind the scenes in one of Australia’s most sensational undercover busts, including never-before-heard detail of the covert investigation, including how Cowan was slowly brainwashed into believing ‘Mr Big’. Read what Cowan’s family think of their black sheep. A fascinating read! But don’t be quick to judge me – I am not referring to the horrendous atrocities that Daniel Morcombe’s murderer is guilty of, I am referring to the outstanding efforts that the Queensland, West Australian and Victorian police force made to apprehend this criminal; such lengths, the covert officers deserve an academy award for their part in capturing this offender. Their story is fascinating. Kate Kyriacou presents a sensitively written narrative of two parts; the first act introduces the “players” and sets the scene. We meet the offender, the families involved, we get some background on locations and personal histories, insights to the main characters and the revelation of the story of a missing boy, soon to be presumed dead. We meet Daniel Morcombe and his family. We share the fear that all parents share when a child goes missing. We meet Brett Peter Cowan and fear for whoever crosses his path – an opportunistic psychopath that evokes no empathy. A nation trembled in fear when Daniel Morcombe went missing in December 2003. The author provides us with a background to both families involved in this tragedy. We learn of Brett Cowan’s earlier criminal behaviours and the assaults he committed but thankfully we do not get “into his head”. The facts are presented, the behaviours stated simply but we do not “hear “ Cowan’s personal story, we just see his part in it, an observation from the outside and for that I am grateful. We get to meet the Morcombe’s – we feel their despair, we feel their pain. Part Two – The Sting! What an incredible effort that the police forces put into eliciting a confession from their prime suspect in this case. Psychology, role playing, deals and scripted conversations secretly recorded, what a feat! It is a credit to the author, her research and her compulsive style of writing that despite knowing the outcome of this covet operation, I was on the edge of my seat, cheering the operatives on, hoping they found the evidence they needed in time to secure the arrest and conviction of Daniel Morcombe’s murderer. Well written Kate Kyriacou! 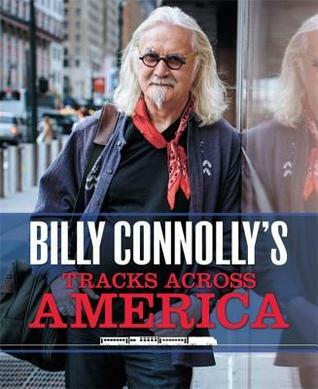 Billy Connolly – raconteur, comedian, and irrepressible wanderer – has spent much of his life in the United States. It’s a country he knows and loves a great deal, but even someone as well-travelled as Billy can always discover knew things about such a vast nation. So he’s off on the move again, this time via the tracks of the great railroads that helped to build the country. Billy’s latest adventure takes him on an epic trip through the backyard of America, tracing the routes taken by the first European settlers westwards from Chicago to California, then back down south and eastwards through Arizona, Texas, Alabama and finally New York, over 6,000 miles and 26 states later. It’s a journey through a country you don’t get to see from 30,000 feet in the air – the real America of friendly people with fascinating tales to tell which not only give us an insight into their lives, but also into the life of their great homeland. And it’s a journey that couldn’t be shared with a more entertaining companion. Hope aboard and join Billy on a trip you’ll never forget. Billy Connolly Fan? Arm chair traveller? Coffee table picture book fan? This book has something for everyone. There is even something for the true crime reader fan – (p.266) The Murder Dolls: CSI Miniature 🙂 This section is fascinating – all about the dioramas of violent and brutal crimes designed by Frances Glessner Lee for student medical examiners to practice their skills, fascinating! This book is just full of surprises. I love listening to accents – and as I read this I hear Billy Connolly’s beautiful Scottish accent, in fact I think this would make a great audio book and I picture the sparkle in his eyes but I digress… this book is full of surprises, wonderful images of people and places that are equal to any seen in photographic displays or wall art on contemporary spaces, pictures of the everyday and the extraordinary. Old faces, young faces, buildings, panoramas… there are stories behind each image. This is a delightful entertaining read full of the most amazing photography! 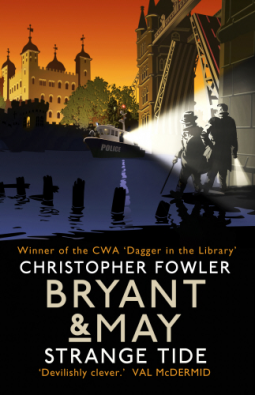 As the detectives’ disastrous investigation comes unstuck, the whole team gets involved in some serious messing about on the river. In an adventure that’s as twisting as the river upon which its set, will there be anything left of the Peculiar Crimes Unit when it’s over? Wacky and bizarre, this episode is full of eccentricities and over the top behaviours by our beloved Arthur Bryant and for a short while Bryant is convinced that he is developing a type of dementia or the like ) read the clues scattered like crumbs and you will draw your own conclusion. This is another enjoyable episode in the life of The Peculiar Crimes Unit – I love the trip down memory lane and the weaving of past and present stories to create this new mystery. Fun, whacky, the images of false teeth, funky smelling sandwiches in coat pockets, etc. slightly gross, there is an almost slapstick comedic manner about the writing … mixed with a serious mystery, an entertaining read. ** I have an image in my head of an actor who I think would play this part well…wish I could remember his name…it will come to me.